I’m going to rush through my Friday morning eats because honestly I gotta get to the good stuff and get to it soon! The workout was a 4.5 mile run on the treadmill (too rainy and gross out to do it outside), and I actually felt fantastic afterwards! 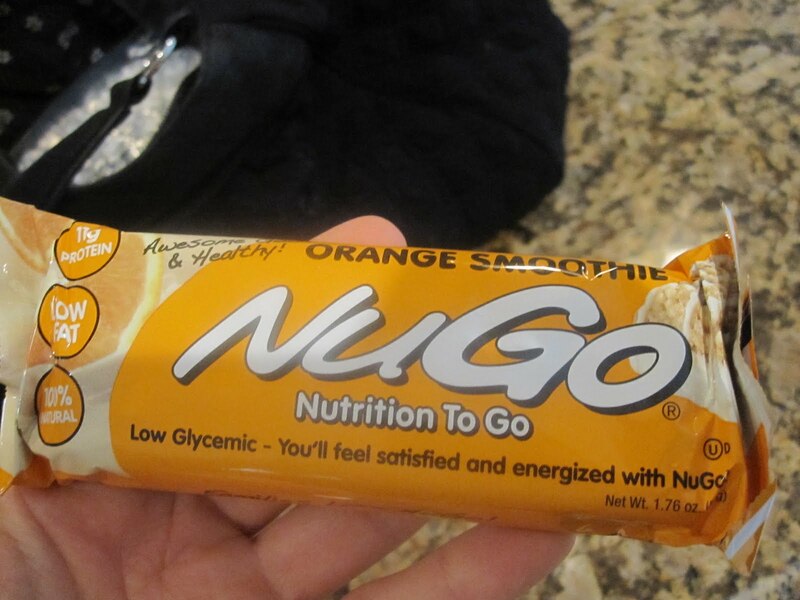 Nu-Go Orange Smoothie Nutrition Bar for my midmorning nosh. This seriously tasted like a creamsicle. After rehearsal, I picked up The Yoga Master and we made our way into New Britain to try our chances at appearing in a commercial! Unfortunately by the time we got there and met up with some of her friends, the set was closed. No fun. But we ended up having a great day anyway because we went to Whole Foods and Trader Joe’s, and I found the new Larabars!!!!! Cannot wait to try them! I think I’ll eat the carrot cake one tomorrow. After Whole Foods we went to check out Lululemon, a yoga and overall athletics store that just opened in West Hartford. It’s quite expensive but the stuff is definitely lovely! Connie was really jazzed about a great hoodie/sweatshirt combo she found that almost feels like a second skin (and it makes you look streamlined! ), and I was torn between two SIGG water bottles. One said “I ❤ Running" and one said "I ❤ Yoga." What's a girl to do?! Connie was so sweet and bought me one because my debit card wasn't exactly working correctly…I'll keep as a surprise for my next entry. 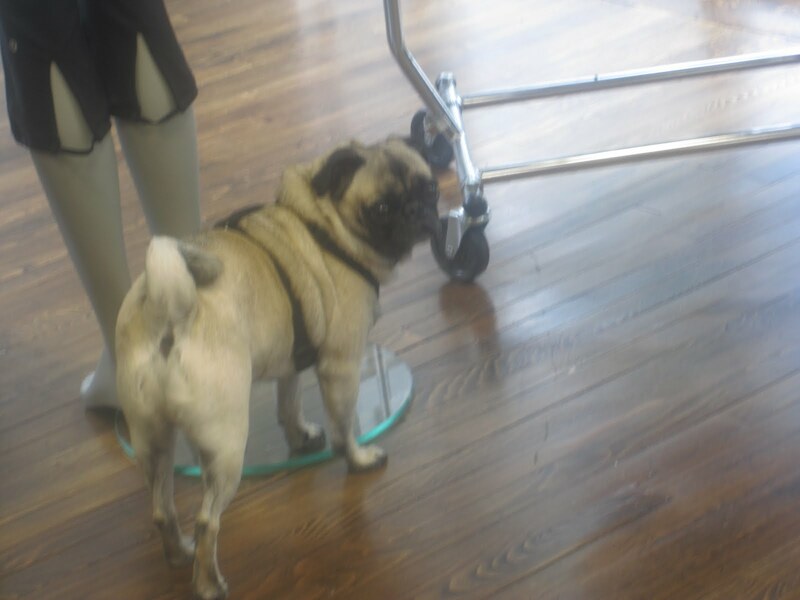 At Lululemon we also met the sweetest little doggie. He is owned by the owner of the store, and he was the most gentle dog I think I’ve met in a long time. I turned around to ask Connie a question and found her sitting on the couch, playing with him! how could anyone resist that snoots? After a quick stop at the bank, Trader Joe’s was as always awesome. I picked up another carton of Mini Milk Chocolate PB Cups, as well as a carton of Dark Chocolate Covered Pomegranate Arils, Pacific Almond Milk (and I got Connie to purchase some too! ), Blueberry/Cranberry Bran Muffins, and Tempeh. Yesterday morning (my day off!) I woke a little later and immediately broke into a present Connie’s uncle had gotten me all the way from London! I will not lie, I SCREAMED when she handed this to me. Connie’s a HUGE fan of Paddington Bear and I love him too! When we visited her relatives in London, her uncle kept making fun of my inability to correctly use chopsticks. When he sent her this package, he sent another one addressed to “Your friend who can’t use chopsticks”. I was so happy and grateful! 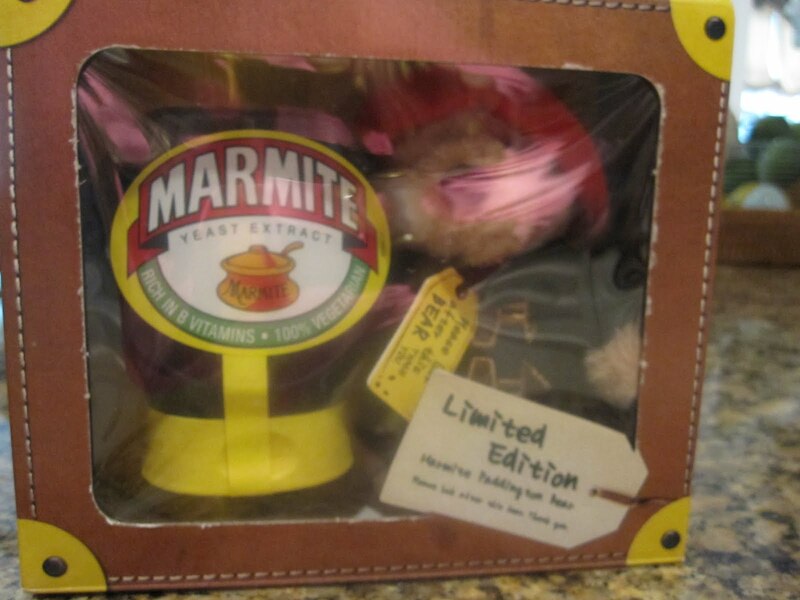 And it came with Marmite, which I’ve heard SO much about from my British friends. I was over the moon! 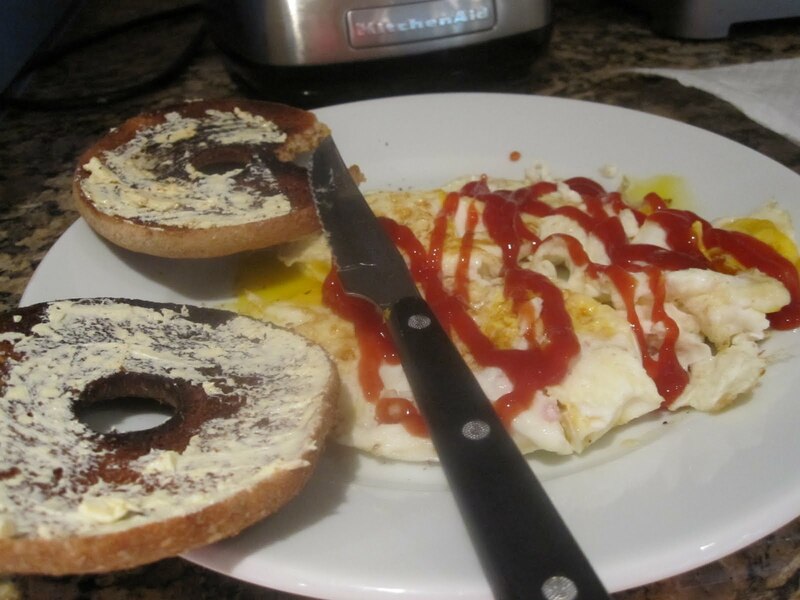 I knew I had to try the Marmite in some way, so I used it on my Bagel Thin with a bit of Smart Balance, as well as 3 eggs over medium. I usually only eat two eggs, but yesterday I was living dangerously! My verdict? I like it! I’ve heard that Marmite is one of those things you adore or you think tastes like sewage; apparently the logo in Britain is “Marmite: Love It Or Hate It.” To me, it tasted like a thick, syrupy soy sauce. And I love soy sauce. Connie asked if I wanted her bottle after I emailed her my thoughts…I don’t know if I’m going to need two bottles of it, but I want to try the suggestion on the box of pairing it with cheese and bread. Perhaps on Tuesday? I think it’ll work with a sharp cheddar and dark bread…perhaps that Hemp bread I haven’t eaten in a while? 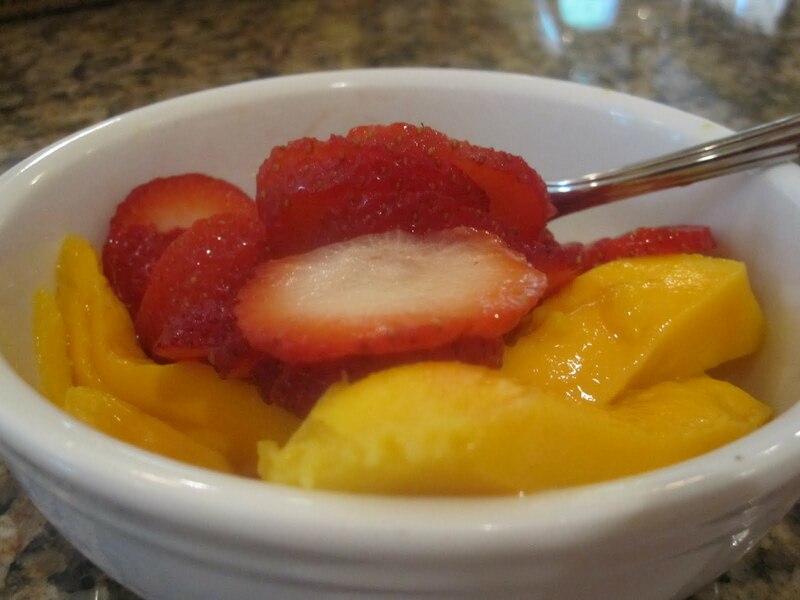 For my breakfast dessert, I had a small champagne mango and some strawberries. And my afternoon snacks consisted of a large peach and a huge bowl of cherries. 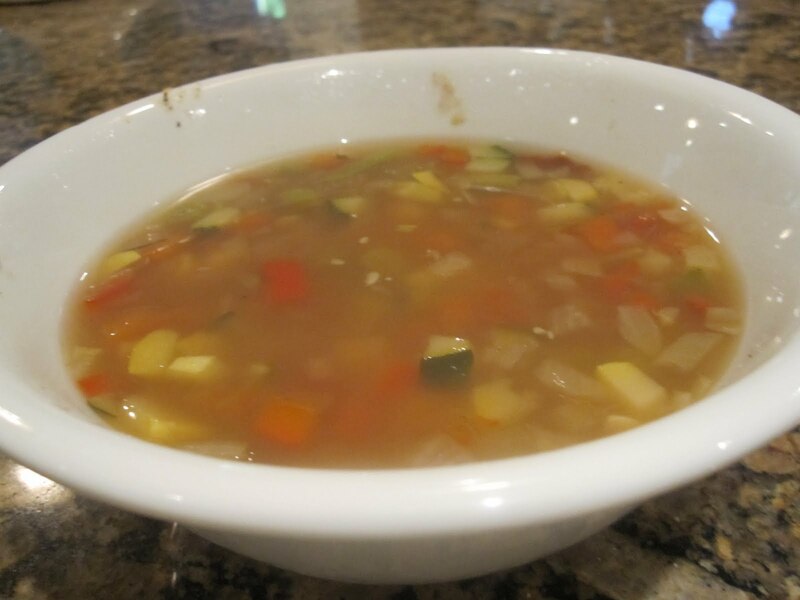 My tummy was FULL of fiber, and I was so uncomfortable! Dinner was very pleasant. I had purchased posole, a Mexican soup made with hominy, at Whole Foods. 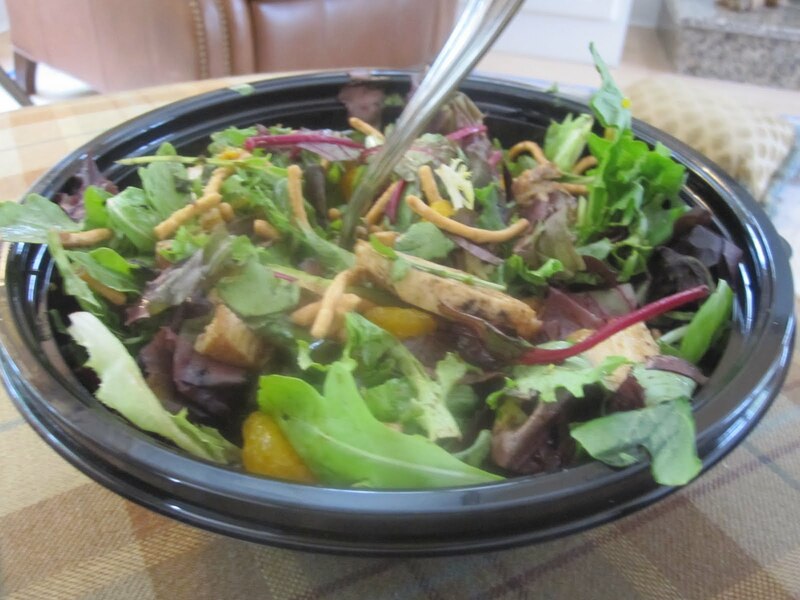 I had eaten some of it with my lunch on Friday so I decided to eat the rest of it last night for dinner. It was only 120 calories so I knew it wouldn’t be enough for dinner, so I ended up whipping up a pupusa! Combine water and cornmeal until a paste forms. Cover it and let it sit for 15 minutes. Sprinkle with 1 tbsp of the cheese, and attempt to fold it in half (I didn’t let it wait long enough so it was kind of mushy!). 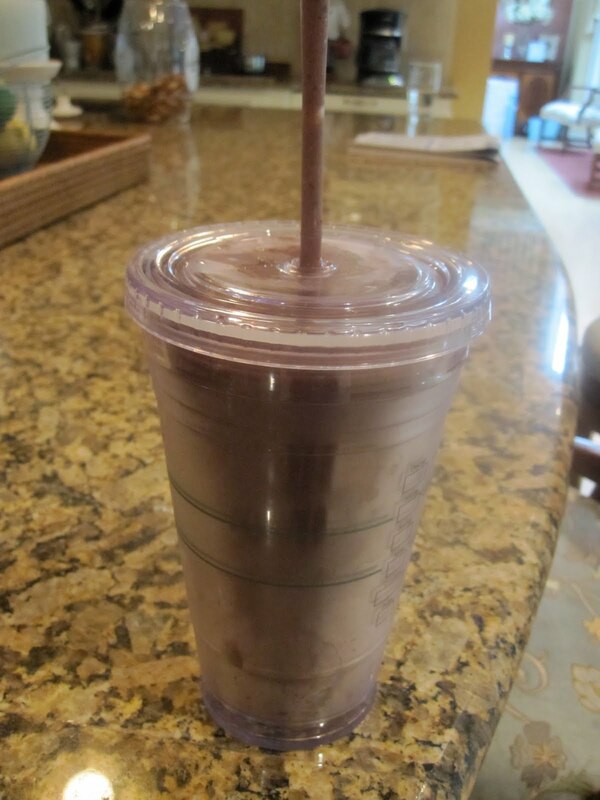 Stick in microwave for 1 minute to solidify. Heat a skillet over medium high, sprayed with cooking spray. When hot, place pupusa in skillet and heat through until cheese is melted. Top with the rest of the cheese and salsa. What did it taste like? Really good! 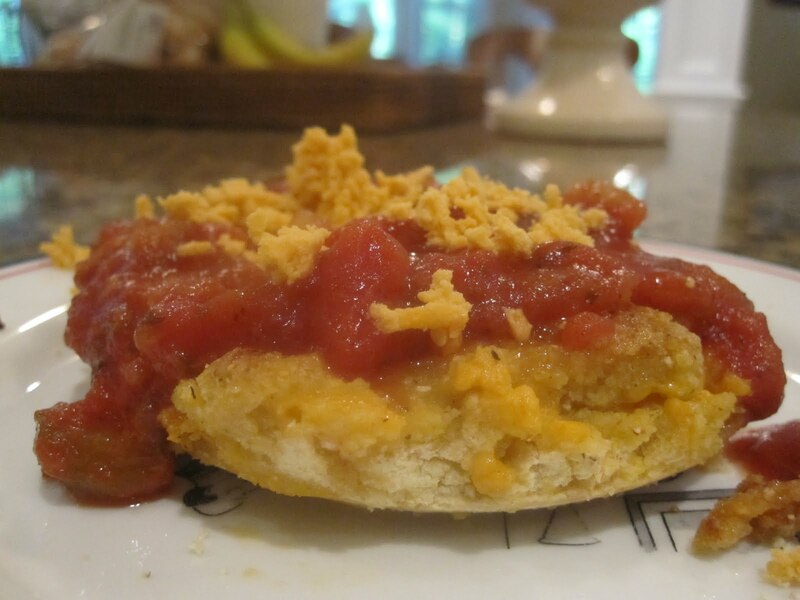 A sort of cheesy polenta. The original recipe called for corn flour, which is a LOT easier to handle and acts more like a dough than grits. I still enjoyed it very much, and it tasted great alongside the posole, which did its best to clear out my sinuses. Damn! Mucho spices!